Multisite Support. Besides standard single site capability, Duplicator Pro supports multisite network backup & migration and can even install a subsite as a standalone site. Large Database Support. The ability to manually import a SQL file means very large databases are now supported. Backup Limits. Limit your number of stored backups. So you don't fill up your Dropbox with 423 previous backups & help keep your endpoints clean. Filter Data. Filter only the directories, files, extensions and database tables you want to backup. Auto Database Creation. Easily select existing cPanel databases & users or create new ones without ever leaving the installer. Email Notifications. Know immediately when Duplicator has issues with a backup, times out or needs some attention. Large Site Support. The overhauled package engine is faster and works better with larger sites. 2GB+ on most budget hosts & 10GB+ on higher end hosts. Database File. Easy access to only the database file should you only need to restore a database. Advanced Options. 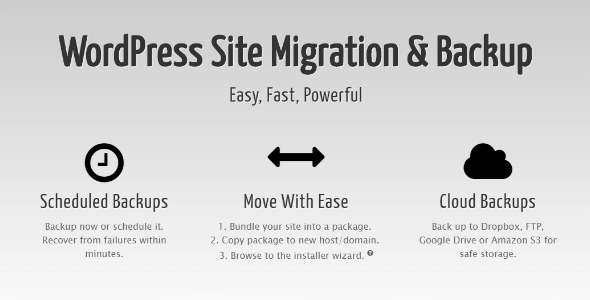 Tons of advanced options to customize your WordPress backup and customize your install. Incredibly useful toolkit for every WordPress developer. Thanks! Привет, ваш сайт очень приятный. Большое спасибо за плагин резервного копирования WordPress. I’m using All in one Wp migration. Also good plugin too. Is this nulled?What ‘s the difference between them ? Great backup plugin, easy to use i recommend it.